For other uses, see Sickle (disambiguation). A sickle, bagging hook or reaping-hook, is a hand-held agricultural tool designed with variously curved blades and typically used for harvesting, or reaping, grain crops or cutting succulent forage chiefly for feeding livestock, either freshly cut or dried as hay. Falx was a synonym but was later used to mean any of a number of tools that had a curved blade that was sharp on the inside edge such as a scythe. 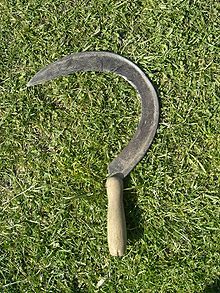 The sickle had a profound impact on the Agricultural Revolution by assisting in the transition to farming and crop based lifestyle. It is now accepted that the use of sickles led directly to the domestication of Near Eastern Wild grasses. Research on domestication rates of wild cereals under primitive cultivation found that the use of the sickle in harvesting was critical to the people of early Mesopotamia. The relatively narrow growing season in the area and the critical role of grain in the late Neolithic Era promoted a larger investment in the design and manufacture of sickle over other tools. Standardization to an extent was done on the measurements of the sickle so that replacement or repair could be more immediate. 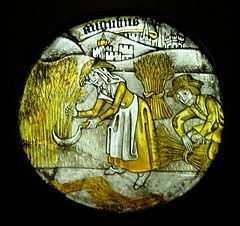 It was important that the grain be harvested at the appropriate time at one elevation so that the next elevation could be reaped at the proper time. The sickle provided a more efficient option in collecting the grain and significantly sped up the developments of early agriculture. 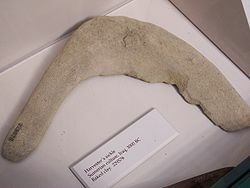 The sickle remained common in the Bronze Age, both in the Ancient Near East and in Europe. Numerous sickles have been found deposited in hoards in the context of the European Urnfield culture (e.g. Frankleben hoard), suggesting a symbolic or religious significance attached to the artifact. In archaeological terminology, Bronze Age sickles are classified by the method of attaching the handle. E.g. the knob-sickle (German Knopfsichel) is so called because of a protruding knob at the base of the blade which apparently served to stabilize the attachment of the blade to the handle. Due to this passage, despite the fact that Pliny does not indicate the source on which he based this account, some branches of modern Druidry (Neodruids) have adopted the sickle as a ritual tool. The sickle has been discovered in southwest North America with a unique structure. These sickles are said to possibly have originated from the Far East. There is evidence that Kodiak islanders had for cutting grass “sickles made of a sharpened animal shoulder blade”. The artifacts found in present-day Arizona and New Mexico resemble curved tools that were made from the horns of mountain sheep. A similar site discovered sickles made from other material such as the Caddo Sickle, which was made from a deer mandible. Scripture from early natives document the use of these sickles in the cutting of grass. The instruments ranged from 13 to 16 inches tip to tip. Several other digs in eastern Arizona uncovered wooden sickles that were shaped in a similar fashion. The handles of the tools help describe how the tool was held in such a way so that the inner portion that contained the cutting surface could also serve as a gathering surface for the grain. Sickles were sharpened by scraping a shape beveled edge with a coarse tool. This action has left marks on artifacts that have been found. The sharpening process was necessary to keep the cutting edge from being dulled after extended use. The edge is seen to be quite highly polished, which in part proves that the instrument was used to cut grass. After collection, the grass was used as material to create matting and bedding. The sickle in general provided the convenience of cutting the grass as well as gathering in one step. In South America, the sickle is used as a tool to harvest rice. Rice clusters are harvested using the instrument and left to dry in the sun. The genealogy of sickles with serrated edge reaches back to the Stone Age, when individual pieces of flint were first attached to a “blade body” of wood or bone. (The majority among the well-documented specimens made later of bronze are smooth-edged.) Nevertheless, teeth have been cut with hand-held chisels into iron, and later steel-bladed sickles for a long time. In many countries on the African continent, Central and South America as well as the Near, Middle and Far East this is still the case in the regions within these large geographies where the traditional village blacksmith remains alive and well. England appears to have been the first to develop the industrial process of serration-making. Then, by 1897, the Redtenbacher Company of Scharnstein, in Austria—at that time the largest scythe maker in the world—designed its own machine for the job, becoming the only Austrian source of serrated sickles. In 1942, its recently acquired sister company Krenhof also began to produce these. In 1970, a year before the sickle production branch of Redtenbacher was sold to Ethiopia, they were still making 1.5 million of the serrated sickles per year, predominately for market in Africa and Latin America. There were other enterprises in Austria, of course, who produced the smoothed-edged sickles for centuries. The last of the classical "round" versions were forged until the mid- eighties and machined until 2002. While in Central Europe the smooth-edged sickle—either forged or machined (alternately referred to as "stamped") - has been the only one used (and in many regions the only one known), the Iberian Peninsula, Sicily and Greece long had fans of both camps. The many small family-owned enterprises in what is now Italy, Portugal and Spain produced sickles in both versions, with the teeth on the serrated models being hand-cut, one at a time, until the mid-20th century. The Falci Co. of Italy (established in 1921 as a union of several formerly independent forges) developed its own unique method of industrial scale serrated sickle production in 1965. Their innovations, which included tapered blade cross section (thicker at the back - for strength - gradually thinning towards the edge - for ease of penetration) were later adopted by Europe’s largest sickle producer in Spain as well as, more recently, a company in India. Today, Italy remains the world’s first regarding sickle quality, and China regarding numbers produced per year. The present global demand is about 75% serrated to 25% smooth-edged, and the majority (of both types of sickles combined) is used in cereal harvesting. Progressive developments in agricultural technology notwithstanding, a significant portion of 21st century Earth's dwellers would perish if millions of sickles were still not swung each season in an effort to procure "the daily bread". The inside of the blade's curve is sharp, so that the user can either draw or swing it against the base of the crop, catching the stems in the curve and slicing them at the same time. The material to be cut may be held in a bunch in the other hand (for example when reaping), held in place by a wooden stick, or left free. When held in a bunch, the sickle action is typically towards the user (left to right for a right-handed user), but when used free the sickle is usually swung the opposite way. Other colloquial/regional names for principally the same tool are: grasshook, swap hook, rip-hook, slash-hook, reaping hook, brishing hook or bagging hook. The blades of sickle models intended primarily for the cutting of grass are sometimes "cranked", meaning they are off-set downwards from the handle, which makes it easier to keep the blade closer to the ground. Sickles used for reaping do not benefit by this feature because cereals are usually not cut as close to the ground surface. Instead, what distinguishes this latter group is their often (though not always) serrated edges. A blade which is used regularly to cut the silica-rich stems of cereal crops acquires a characteristic sickle-gloss, or wear pattern. Like other farming tools, the sickle can be used as an improvised bladed weapon. 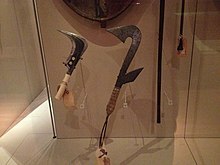 Examples include the Japanese kusarigama and kama, the Chinese chicken sickles, and the makraka of the Zande people of north central Africa. Paulus Hector Mair, the author of a German Renaissance combat manual also has a chapter about fighting with sickles. It is particularly prevalent in the martial arts of Malaysia, Indonesia and the Philippines. 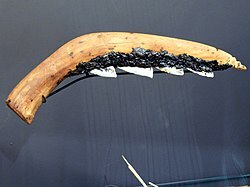 In Indonesia, the native sickle known as celurit or clurit is commonly associated with the Madurese people, used for both fighting and as a domestic tool. The sickle is used as part of the well known symbol of the hammer and sickle, which was the symbol of the former Soviet Union. It is the symbol of Communism or Revolutionary Socialism. The sickle represents the agricultural working class or peasantry in this symbol. The emblem of the Grim Reaper, who is sometimes portrayed as carrying a sickle rather than the more traditional scythe. Tacitus reports that golden sickles were used in Druidic rituals. Paulus Hector Mair's Manuscript Dresd. C 93 includes a section regarding the martial application of the sickle. Three (or two) entwined sickles were the heraldic badge of the medieval Hungerford family. See also Hungerford knot. A bagging hook, badging hook, fagging hook, reap hook or rip hook, is a large sickle usually with an offset handle so that the user's knuckles do not make contact with the ground. The Oxford dictionary gives the definition of the word to bag, or badge, as the cutting of grain by hand. The blade is heavier than that of a normal sickle and always without serrated blades. It is usually about 1.5" (40 mm) wide with an open crescent shaped blade approx 18" (450mm) across. It developed from the sickle in most parts of Britain during the mid to late 19th century, and was in turn replaced by the scythe, later by the reaping machine and subsequently the swather. It was still used when the corn was bent over or flattened and the mechanical reaper was unable to cut without causing the grain to fall from the ears and wasting the crop. It was also used in lieu of the bean hook or pea hook for cutting field beans and other leguminous crops that were used for fodder and bedding for livestock. Sometimes confused with the heavier and straighter billhook used for cutting wood or laying hedges. While the scythe or bagging hook blade was heavy enough to remove young growth instead of, say, shears for clipping a hedge, it was not strong enough to cut woody material for which the stronger, similarly shaped, but longer handled, staff hook was used. Many variations in blade shape were used in different parts of England and known under a variety of names. Its close relations in shape and usage are the grass hook and the reap hook. ^ a b Unger-Hamilton, Romana (July 1985). "Microscopic Striations on Flint Sickle-Blades as an Indication of Plant Cultivation: Preliminary Results". World Archaeology. 17 (1): 121–6. doi:10.1080/00438243.1985.9979955. ^ a b Banning, E.B. (1998). "The Neolithic Period: Triumphs of Architecture, Agriculture, and Art". Near Eastern Archaeology. 61 (4): 188–237. doi:10.2307/3210656. JSTOR 3210656. ^ Unger-Hamilton, Romana (1989). "The Epi-Palaeolithic Southern Levant and the Origins of Cultivation". Current Anthropology. 30 (1): 88–103. doi:10.1086/203718. ^ Christoph Sommerfeld: Gerätegeld Sichel. Studien zur monetären Struktur bronzezeitlicher Horte im nördlichen Mitteleuropa (Vorgeschichtliche Forschungen Bd. 19), Berlin/New York 1994 ISBN 3-11-012928-0, p. 157. ^ Pliny the Elder. Natural History XVI, 95. ^ a b Heizer, Robert F. (1951). "The Sickle in Aboriginal Western North America". American Antiquity. 16 (3): 247–252. doi:10.2307/276785. JSTOR 276785. ^ Works, Martha A. (1987). "Aguaruna Agriculture in Eastern Peru". Geographical Review. 77 (3): 343–358. doi:10.2307/214125. JSTOR 214125.